If you’ve been following along here long enough, you would know that every time I have come back from a girl’s trip to Vegas, I have shared whatever special granola bite that I made up for that trip. Examples here and here. Each time they’ve been a little different, but I’m excited to say that, in the words of my friend Alicia, these were pretty perfect. Now, that doesn’t mean that I won’t keep playing around with different combinations, proportions, and flavor pairings, but it’s nice to know that I’ve found something that works. Completely unrelated, but I can’t contain myself. I got my new planner in the mail today that I ordered from lizzielou creations on Etsy and I am in love. It’s beautiful, I literally love every feature in it (monthly goals, future plans, a birthday/event/notes section for each month, the month at a glance, columns for each day without the pesky time stamps, and a large to do list section for each week). I brought it with me to work today so I could literally hold it and update it with my work schedules, to do lists for the week. I even got to write down about the audition I just got for this afternoon. 8:15-8:50 wake up, eat breakfast. As for homework, I used to make homework to do lists for the week, since it was easier to have it all listed on one sheet by day than have to flip through each syllabus. That way, each day I could try and plan out what homework I could get done when. I even tried to time out my homework, so it would look something like 7-8 stats homework, 8:10-9:10 theater reading, 9:20-10:30 outline theater essay, 10:45-11:45 psych reading. I’m almost just tempted to post some old screenshots of my iCal because it’s unreal how much stuff I packed into my days. Each day was different, depending on if I had work, rehearsal, meetings, special events. Obviously, some days had almost nothing scheduled so I did have some balance in my life, but I liked to keep busy. And to be honest, as crazy as my schedule was in college, the great majority of Wesleyan kids were the same. A lot of people also double majored, volunteered, played a sport, was the president of a club, performed in theater or dance shows. I never felt like I was the only one doing as much as I did. We all worked hard but never had to sacrifice our grades for a social life, a social life for grades, or sleep for grades and a social life. If that makes sense. However, to say that I’ve relaxed with my lists and planning since then has been an understatement. I still make lists and plan a lot, but because I’m no longer taking 4-6 classes, 1-2 shows at a time, a dance performance, 2 jobs, meeting with groups, or volunteering, it’s a little easier to manage my life. But, with my current work schedule always changing due to the way restaurants work and the fact that with the career I’ve chosen (acting) I have to be very proactive and work at it every day, I wanted a planner that would help me. I used to rely only on my iCal but now that I only use my computer when I’m at home (instead of 10+ hours a day for class notes, homework notes, rehearsal notes..) I finally found a planner – called the to do list planner – that I think will really help me tackle 2014. And now I think I’ve gone off the deep end. Very long story short. I love lists. And planning. And planners. 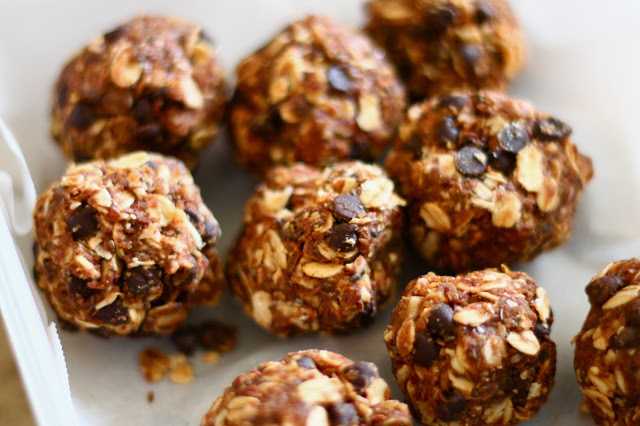 If I haven’t scared you off yet with that insane and intense look into my love of lists, let’s talk about these granola bites. These are delicious. There is texture, flavor, a hint of sweetness from the honey and vanilla, just enough chocolate from the cocoa powder and mini chocolate chips, and they hold together really well. Unlike granola bites of Vegas trips past, these ones hold their shape well after refrigeration AND at room temperature. I think I finally was able to get good proportions between the dry and wet ingredients. All I know is these will definitely be making appearances in my diet. It was nice to munch on one or two of the left overs for a snack between shifts instead of reaching for a less health alternative. 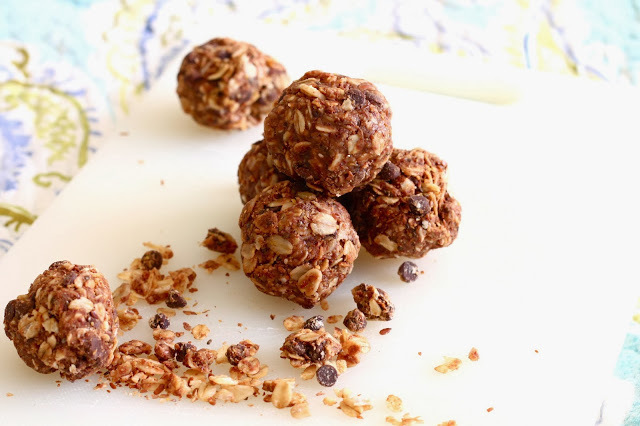 If you’re looking for a delicious granola bite to pack with your lunches or to give you extra fuel for the insane amount of things on your to do list, give these a try. 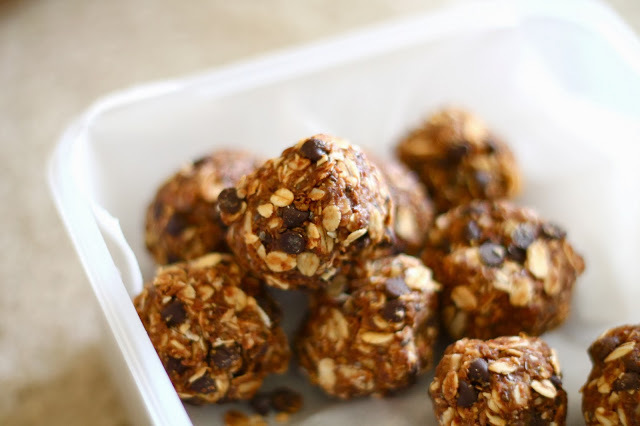 In a large mixing bowl, mix together oats, flaxseed, chia seeds, almonds and cocoa powder. In a microwave safe bowl, add peanut butter and microwave until peanut butter becomes runny, anywhere between 15-60 seconds. Drizzle vanilla, peanut butter, and honey over the oat mixture and mix until the granola sticks together. Stir in the chocolate chips. Refrigerate mixture for 30 minutes and then form into golf sized balls. Store in an airtight container.